I never really understood those who cry when they see their favorite celebrities. Well, until today. The moment I saw Sharon get up to meet me and extend her arms to hug me, I almost cried. "Aileeeeeen!" her happy voice filled the room. She held my face with both her hands and said, "sooooo pretty!" And then she hugged me tight, like I was a long lost friend. My heart was bursting and I was on the verge of crying, but I held back tears. She then introduced me to her team who were all so very nice. "This is Aileen," she said, "a friend I met on Twitter." I'm not sure if I heard that friend part right, but I almost cried again. How sweet is that introduction? I've been following Sharon on Twitter since she started. And you know how there are people you just 'get'? That's how I feel about her tweets. I just get her. Later on, when she started replying to my tweets, I realized she gets me, too. At one point, I entertained the thought that we might be kindred spirits. But that would be presumptuous of me because she is a megastar and I am, uhm, a free floating nameless planet. Haha. In the tweets and DMs we've exchanged, Sharon sounded really nice and funny and sweet. Meeting her today confirmed all that. And more. Out of her many good qualities, it's her sincerity that struck me the most. There's something so genuine, so gentle, so vulnerable about her that is quite endearing. She is also such a positive energy that she lights up a room when she enters. Today, she showed me clips of her new series. I think it will be a hit. We talked a little, laughed a lot. For the most part, I was speechless and starstruck. Haha. I even forgot to hand her my note! *sigh* I hope we get to see each other again and talk about food, travel, books, life, and love, perhaps, over afternoon tea. When I said goodbye, she said: "Come back anytime. Just let me know." And then we hugged. Three tight bear hugs (yes, I counted. haha). When my friends learned that I met Sharon today, everyone was so excited. They asked me to post pictures immediately. I told them I only have one photo. ONE. And it was Sharon who suggested we have a picture together. If she didn't, I'd probably hate myself forever for being so shy to ask. Haha. I am a shutter-happy person, I wanted to take a gazillion photos of her. But I didn't because I felt that if I did, it would be disrespecting her space and privacy. 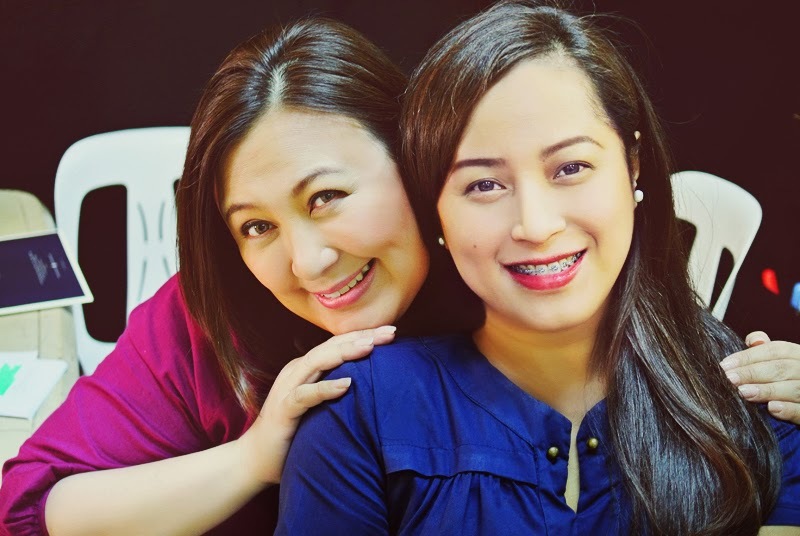 "I am with Sharon Cuneta." I texted my sister Abbie. "Suya ko (I envy you)," she replied. She and I are big fans. When we were in elementary and highschool, we used to make scrapbooks upon scrapbooks of Sharon's pictures and magazine clippings. We've watched all of her movies. Speaking of movies, when we got home after watching Bukas Luluhod Ang Mga Tala, I wrote in my notebook every word of conversation in that movie! I mentioned Abbie to Sharon and she said: "Sana sinama mo siya!" "She's in Cebu," I said. "Awww, sayang. Di bale, when we go to Cebu, maybe we could meet." My sister got pretty excited when I told her. I think she won't be able to get any decent sleep from now on. Haha. Also, I realized my friends are Sharonians! This is such a memorable 15th anniversary. Thank you, Sharon. Today is another proof that nothing is impossible and that wishes come true. Wow. I'm not surprised that even Sharon Cuneta found you to be a very likable person. Wow lucky you! I'd be thrilled if I met SC in person! I saw her concert in the early 90's but I was sitting too far from the stage. Bambi is a huge fan, im sure she'll be jealous if she see this picture! so lucky of you Ai!but i know, nothing is impossible jud. i'm so happy for you.thanks for sharing & God bless! I'm thrilled by your post :). Nothing is impossible indeed! If you were with me, Chi, magdungan tag hilak. I was alone and na-shy ko. Haha. I miss you! I just realized we all are Sharonians! I'll tell Bambi of this meeting! She'd be so happy for me (although yes, I think she'd be jealous). Haha. thrilled and happy for you Ms. Ai. I am a fan of SC too. And yes, SC is right, you are pretty. This should be made into a poster.. i feel like im closer to Sharon Cuneta now, because of you.. (char! nakiapil!) hehehe.. Here's to hoping you'll have more meet-ups soon!